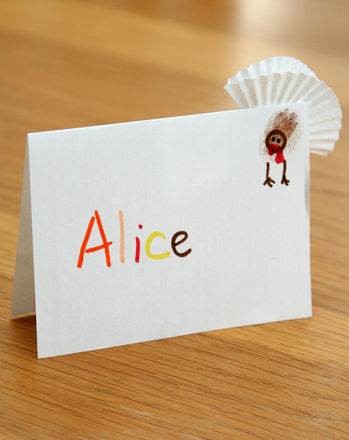 If Thanksgiving in your family involves lots of relatives your kids may only see a few times a year, this fun and easy project is a great way to help your child remember who’s who, practise his handwriting and get a little Thanksgiving crafting done. She'll also get to learn a little bit about her family tree. Leafy name tags are simple to make, and displaying them in a festive family tree is a guaranteed crowd pleaser. Start by making a list of your holiday attendees. Help your child cut out a piece of cardstock for each family member that will be at your Thanksgiving celebration. The name tags should be about 3"x4" in size. Help your child place a small amount of glue onto the back of each name tag, then press the pin back firmly in place. Let the name tags dry. Meanwhile, you and your child can go through the silk leaves, if necessary, and choose the ones you want to use. Depending on the size of the leaves and your name tag, you may want to put one leaf or a few leaves on each tag. Arrange the leaves on the tag until you and your child achieve a look you like—just be sure the person’s name stays visible—and glue the leaves in place on the name tag. Set the name tags aside again to dry. 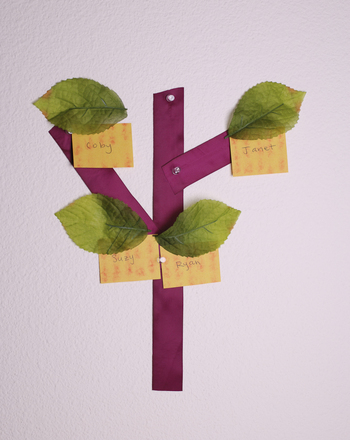 While your name tags are drying, choose a patch of wall to create your tree. (You can put yours in the foyer if you like, so everyone can see it as they arrive, but you can put it anywhere you have enough wall space.) Use your ribbons to create the shape of a tree with branches. Tape the ribbons to the wall with your child's help to figure out how you want your tree to look. Once your tree is done, pin the name tags to the ribbons, putting your family's names on the trunk of the tree and filling in the branches with the rest of the family members' names. You can even organise the names by maternal and paternal sides. Make a game of it by asking your child where she thinks each name tag should go. If you have friends coming to dinner, you can create a special Friends branch. Make your tree bigger if need be. When your guests arrive, they'll be very impressed. Make sure to thank your young decorator too. It is Thanksgiving, after all!